1. Let Pinot Noir breath. No other grape changes so quickly and constantly in the glass. 2. Drink Pinot Noir at 60° to 65°, especially if the alcohol is above 14.5%. 3. Give Pinot Noir some bottle age. If you must drink it soon after release, decant it. 4. Develop your own palate preferences for Pinot Noir and stick with producers who craft wines that suit your style. Don’t chase hi-scoring wines or cult labels. 5. Look to Oregon Pinot Noir if you want lower alcohol and generous acidity in your Pinot Noir. 6. Visit wineries and get to know the people that make the wine. Volunteer to work crush. 7. Attend at least one major Pinot Noir celebration in California or Oregon every year. 8. Embrace Pinot Noir in all of its styles, variations and origins. Try to drink Pinot Noir at its source with local foods. 9. Remember, Pinot Noirs that are balanced when young are balanced forever. Pinot Noirs that are not balanced when young, will never be, and will age poorly. 10. 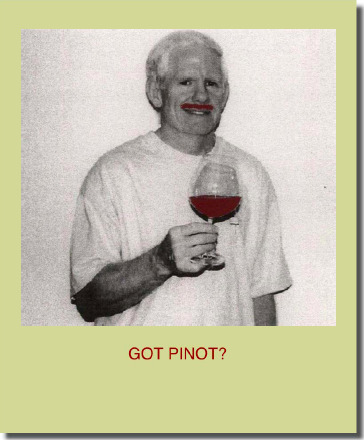 Read the PinotFile religiously.